Co-sleeping is a sleep practice that has had many names in recent years. 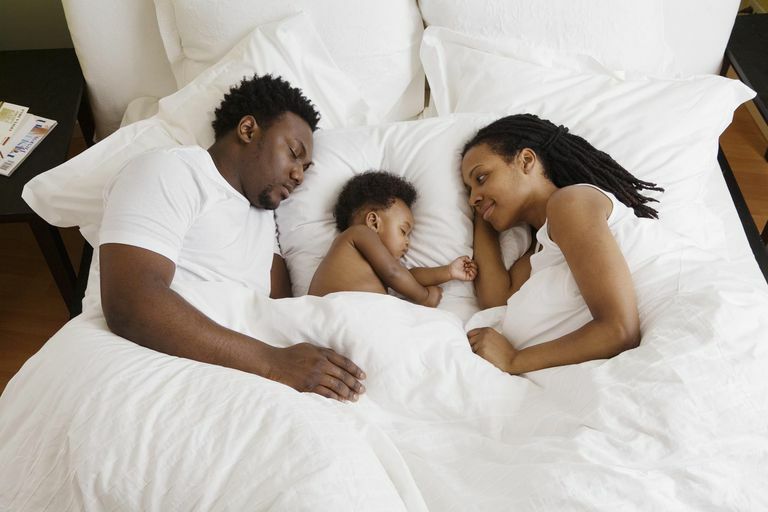 Whether it is called co-sleeping, sleep sharing, or the family bed, all of these approaches are quite similar to each other. Though all of these terms are fairly new, they refer to a parenting practice that has been around for as long as people have been having babies. It just didn't have fancy names until the twentieth century when attachment parents began to advocate the method. Though many may assume that co-sleeping means that parents and baby share the same bed, Dr. William Sears stresses that definition is a bit too narrow. Sears, a well-known pediatrician, and author of many parenting books defines co-sleeping as sleeping within arm's reach of the baby. Many parents, both those who consider themselves to be attachment parents and those who do not, believe that shared sleep has many advantages. Infants who co-sleep go to sleep faster and stay asleep longer. More mothers who co-sleep report feeling better rested. It promotes breastfeeding by making night feedings easier. Some research suggests that infants who co-sleep have stronger emotional relationships with their parents and with other people. Co-sleeping advocates point to research that suggests when parents take sleep safety precautions it reduces the risk of Sudden Infant Death Syndrome. Parents can find a co-sleeping arrangement that best suits their needs. Shared sleep can take on many forms and is adaptable to many lifestyles. The family bed - Parents sleep in the same bed with the baby. Sidecar arrangement - The baby's crib or co-sleeper bassinet is placed directly up against the parent's bed. Three sides of the railing surrounding the crib mattress, but the side abutting the parent's bed is left open. Shared room - Parents and baby have their own beds that are located in the same room. There is no doubt that there is a difference in how well the practice of cosleeping is accepted across cultures. Western culture largely has frowned on the arrangement, whereas cosleeping seems to be the norm in other developing countries. Anthropologists have also noted a difference in the acceptance of the practice based on the general attitude of the society. Collectivist cultures, meaning cultures that place greater value on the good of the group as opposed to the individual, are more likely to cosleep than societies that emphasize the individual. While the American Academy of Pediatrics (AAP) encourages room-sharing, it gives a big thumbs down to sharing a bed with a small infant. They cite research that indicates co-sleeping poses an increased risk to the baby's health and well-being. Attachment Parenting International and the AAP can't seem to agree on the reliability and validity of existing co-sleeping safety research, and that certainly can be alarming to parents. The conflicting research brings up another sticking point that critics will argue. Many feel that there simply isn't a great enough body of research on the short-term and long-term benefits of co-sleeping. Some believe more research is needed to verify the claimed benefits of shared sleep. Should not be under the influence of alcohol and drugs, including medications that affect their sleep. Should not cosleep if they have sleep disorders. Should not cosleep in a waterbed or with any soft bedding near the baby. Preferably use a queen or king sized mattress. Should not share a sleep space with their baby if they are extremely obese. Is there a baby sleeping in your bed? What Are the Pros and Cons to Breastfeeding Longer Than One Year? Is It Safe for Breasfeeding Mothers to Use Ginger? Bassinet vs. Crib: Which Is Better for My Baby? Should You Sleep in a Nursing Bra If You're Breastfeeding?